Deployment testing of the Gaia Flight Model Deployable Sunshield Assembly has been successfully completed in preparation for the spacecraft mechanical test campaign. Gaia will perform micro-arcsecond astrometry of over one billion objects in the Milky Way and beyond. In order to achieve the required measurement precision, the spacecraft and its instrument payload must be shielded from direct sunlight and maintained at a stable, low temperature. Any thermal instability at the level of a few hundreds of µK or more could affect the final accuracy of the measurements. The thermal stability of the Gaia spacecraft will largely be determined by the Deployable Sunshield Assembly (DSA), which will protect Gaia and its instruments from illumination by the Sun. 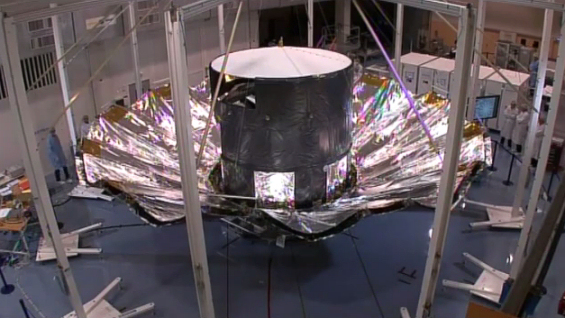 Once deployed, the sunshield will be ~10.2 m across and have an area of ~75 m². SENER (Spain) is responsible for the development and manufacture of the DSA. The design was validated by thermal vacuum and thermal balance testing of the Qualification Model (QM) at ESA's European Space Research and Technology Centre (ESTEC) in July 2009, and by further deployment testing of the QM in the thermal vacuum chamber at Intespace, Toulouse during August 2011. The Flight Model (FM) DSA has already undergone two deployment tests, one at SENER upon completion of manufacturing and one in Astrium Toulouse following thermal cycling. During October 2011, the FM DSA was formally delivered to Astrium (France), the Prime Contractor for the spacecraft, and integrated with the FM Service Module and Thermal Tent and a mass-representative model of the payload module. Once integrated, the first deployment test of the DSA mounted on the spacecraft took place in Astrium on 21 October. This test demonstrated correctness of alignment, confirmed the deployment functionality and verified the flatness of the deployed DSA. The spacecraft was then moved to Intespace in Toulouse for its mechanical test campaign. The DSA consists of 12 panels, each 0.8 metres wide and 3.3 metres long and comprising a carbon-fibre reinforced composite frame covered with two parallel blankets of Multi-Layer Insulation (MLI). The panels are stowed against the spacecraft during launch, secured in place by pyrotechnically releasable fixings referred to as pyronuts. Gaia will operate in a Lissajous orbit around the second Lagrange point of the Sun-Earth system (L2). Once the Fregat upper stage of the Soyuz launcher has injected Gaia into its transfer orbit towards L2, the pyronuts will be fired to initiate DSA deployment. As the 12 panels hinge away from the spacecraft, triangular sheets of MLI that were stowed, rolled between adjacent panels will unfurl to fill the gaps between the panels. The deployment is actuated by preloaded springs that form part of the two hinges that attach each of the panels to the spacecraft body. All 12 panel frames are connected via flexible couplings that make up a single shaft loop to ensure synchronous deployment. The rate of deployment is controlled by two stepper motors, which can provide additional outward torque if required, or can act against the springs to maintain a constant rate of movement and ensure a smooth deployment. Since the DSA will operate in microgravity, it is not designed to support its own weight in the one-g environment at Earth's surface. During deployment testing, the DSA panels are attached to a system of support cables and counterweights that bears their weight, preventing damage and providing a realistic test environment. Time-lapse video of deployment testing of the Gaia DSA. Click here for further details. The mechanical shock induced by the firing of the pyrotechnically releasable fixings at the start of deployment is among the most severe that the DSA will experience in service. To qualify it to withstand this shock, live pyrotechnics were used during the deployment test. Each pyro fixing has two redundant initiators and charges; only one charge in each of the pyronuts was fired during the test. Following completion of the deployment test, the spacecraft is undergoing acoustic and sine vibration testing to qualify it for the noise and mechanical environments specified by the launch authority. In preparation for these tests, the tanks in the FM Service Module have been filled with simulated propellant and later will be subjected to leak testing. The spacecraft will then be moved back to Astrium's premises in Toulouse, where a further DSA deployment test will be performed to ensure that full functionality has been maintained after simulation of the launch environment. The other major mechanical shock that the spacecraft will experience, which will be induced by the release of the clamp band holding the spacecraft to the launch adapter, will be simulated later in the test campaign.